An e-book edition of The Rising of Haunted Ireland by Anthony Kerrigan, Sinead Houlihan, Jenifer Kerrigan has just been published (in time for the Halloween season, now virtually upon us) and available to buy through all the major online distributors. The book takes the reader on a journey through Irish haunted locations on and off the beaten track, providing a comprehensive overview of the world of paranormal investigations, offering something to the skeptic as well as the believer and those who simply wish to form their own conclusions. Since the initial publication, this time last year, of the print edition, the book has proven very popular with the reading public, selling well at bookshops and venues across Ireland and further afield. 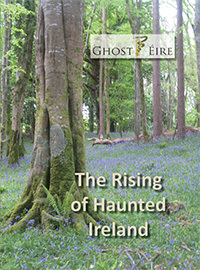 The authors are members of GhostÉire, a team of paranormal investigators based in the south-west of Ireland, who describe their goal as being "to find spiritual and scientific reasons for the paranormal, the supernatural and similarly unexplained phenomena." Their pursuit of this objective has taken them to locations all over Ireland, investigating possible hauntings and supernatural occurrences, accumulating volumes of recorded and independently verifiable source material in the process. Theirs is a world of whispering lighthouses, misty islands, mind-bending gaols, vanished forts and public houses where the spirits flow a little too unaccountably. Tales of sailors, smugglers, pirate queens, Irish rebels, Vikings and spies crop up along the way. The bulk of the presentation comprises precise, detailed, often graphic descriptions of paranormal investigations, typically undertaken during the dark and eery hours in some of very remote and inhospitable places. It should be noted that the book does come with a parental advisory warning (not suitable for anyone under 16 years) containing as it does, some strong language and possibly disturbing themes. The Rising of Haunted Ireland by Anthony Kerrigan, Sinead Houlihan, Jenifer Kerrigan, already available in print editions (hardback and paperback), is on sale now as an e-book edition through global distributors such as Amazon, Smashwords, Apple (iTunes), Barnes & Noble, Kobo, amongst others. Further information about the book (print and e-book editions), where and how to buy can be obtained from the websites of GhostÉire and The Manuscript Publisher.